Dutch philologist; born Sept. 1, 1844, at Leyden; educated at the university of that city (Ph.D. 1869). From 1866 to 1869 he taught classics at the gymnasium of Leyden; from 1873 he taught history at that of Rotterdam; and from 1882 he was conrector and teacher of classics there. In 1894 he was appointed professor of Greek at Gröningen University. Polak is a member of the Royal Academy of Sciences and of the Maatschappij voor Letterkunde of Leyden. 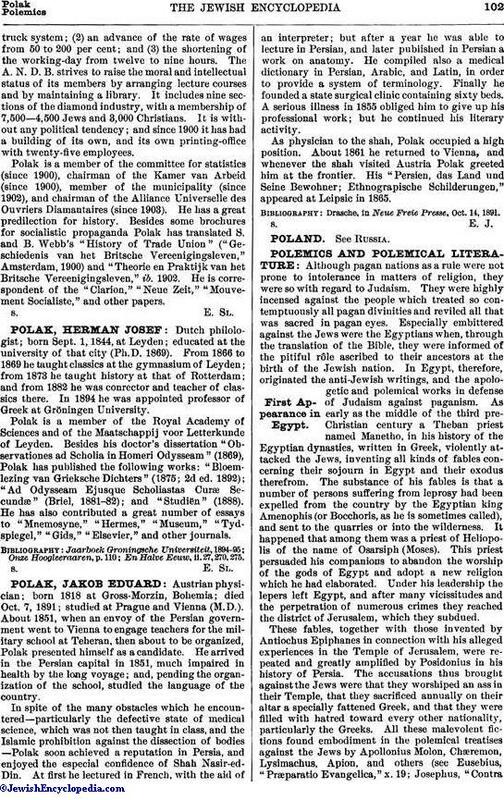 Besides his doctor's dissertation "Observationes ad Scholia in Homeri Odysseam" (1869), Polak has published the following works: "Bloemlezing van Grieksche Dichters" (1875; 2d ed. 1892); "Ad Odysseam Ejusque Scholiastas Curæ Secundæ" (Briel, 1881-82); and "Studiën" (1888). He has also contributed a great number of essays to "Mnemosyne," "Hermes," "Museum," "Tydspiegel," "Gids," "Elsevier," and other journals. En Halve Eeuw, ii. 27, 270, 275.